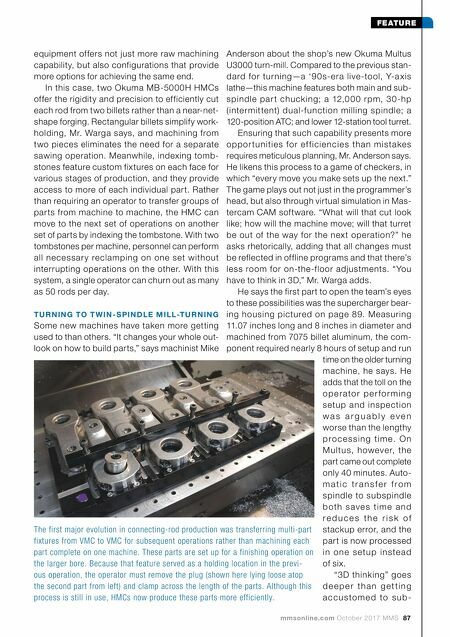 mmsonline.com October 2017 MMS 87 FEATURE equipment offers not just more raw machining capability, but also configurations that provide more options for achieving the same end. In this case, two Okuma MB-5000H HMCs offer the rigidity and precision to efficiently cut each rod from two billets rather than a near-net- shape forging. Rectangular billets simplify work- holding, Mr. Warga says, and machining from two pieces eliminates the need for a separate sawing operation. Meanwhile, indexing tomb- stones feature custom fixtures on each face for various stages of production, and they provide access to more of each individual part. Rather than requiring an operator to transfer groups of par ts from machine to machine, the HMC can move to the next set of operations on another set of parts by indexing the tombstone. With two tombstones per machine, personnel can perform all necessar y reclamping on one set without interrupting operations on the other. With this system, a single operator can churn out as many as 50 rods per day. T U R N I N G TO T W I N - S PI N D LE M I LL-T U R N I N G Some new machines have taken more getting used to than others. "It changes your whole out- look on how to build parts," says machinist Mike Anderson about the shop's new Okuma Multus U3000 turn-mill. Compared to the previous stan- dard for turning—a '9 0s-era live-tool, Y-a xis lathe—this machine features both main and sub- spindle par t chuck ing; a 12,0 0 0 rpm, 30 -hp (intermit tent) dual-function milling spindle; a 120-position ATC; and lower 12-station tool turret. Ensuring that such capability presents more oppor tunitie s for ef f icie ncie s tha n mista ke s requires meticulous planning, Mr. Anderson says. He likens this process to a game of checkers, in which "every move you make sets up the next." The game plays out not just in the programmer's head, but also through virtual simulation in Mas- tercam CAM software. "What will that cut look like; how will the machine move; will that turret be out of the way for the nex t operation?" he asks rhetorically, adding that all changes must be reflected in offline programs and that there's less room for on-the-floor adjustments. "You have to think in 3D," Mr. Warga adds. He says the first part to open the team's eyes to these possibilities was the supercharger bear- ing housing pictured on page 89. Measuring 11.07 inches long and 8 inches in diameter and machined from 7075 billet aluminum, the com- ponent required nearly 8 hours of setup and run time on the older turning machine, he says. He adds that the toll on the o p e r a to r p e r f o r m i n g setup and inspe ction w a s a r g u a b l y e v e n worse than the lengthy p r o c e s s i n g t i m e. O n M u l tu s, h oweve r, th e part came out complete only 40 minutes. Auto- m a t i c t r a n s f e r f r o m spindle to subspindle b o t h s av e s t i m e a n d r e d u c e s t h e r i s k o f stackup error, and the part is now processed i n o n e s e t u p i n s te a d of six. 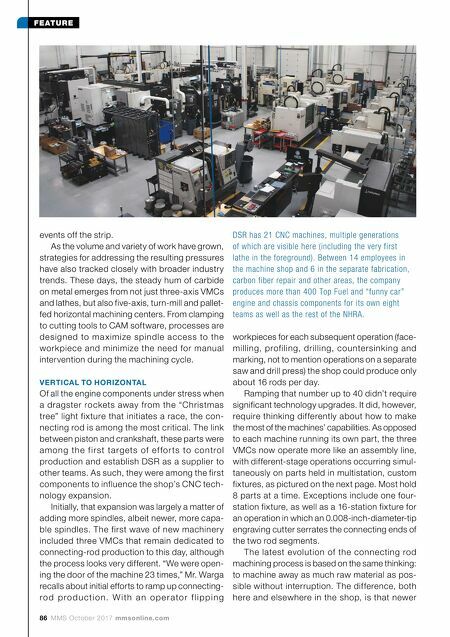 "3D thinking" goes d e e p e r t h a n g e t t i n g a c c u s to m e d to s u b - The first major evolution in connecting-rod production was transferring multi-part fixtures from VMC to VMC for subsequent operations rather than machining each part complete on one machine. These parts are set up for a finishing operation on the larger bore. Because that feature served as a holding location in the previ- ous operation, the operator must remove the plug (shown here lying loose atop the second part from left) and clamp across the length of the parts. Although this process is still in use, HMCs now produce these parts more efficiently.